How do I get my daughter off social media? Researchers warn there are increasingly social issues connected to the use of social media including sleep depravity, anxiety, depression, loss in academic studies and work, and anger management issues, PC world reports. Professor Katina Michael from Wollongong University said social networking accounted for 28 per cent of all media time spent online, and users aged between 15 and 19 spent at least three hours per day on average using platforms such as Facebook, Twitter and Instagram. Ironically, Ms Wagorn took to social media to ask for help regarding her daughter’s social media use. Parent can restrict access to social media on iPhones by going to the “general” section of settings and open restrictions. By enabling restrictions, you can set up a four-digit password which can stop your child from installing the Facebook app or third-party browsers. Apps to exist to help people stay off social media including Offtime (iOS, Android), Moment (iOS), BreakFree (iOS, Android), Flipd (Android) and AppDetox (Android). Andrew Backhouse, 2017, "Mother’s plea: How do I get my daughter off social media?" 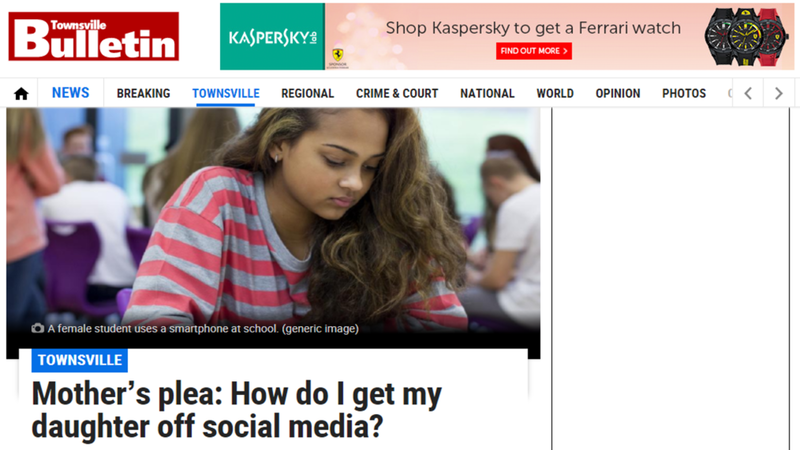 Townsville Bulletin, http://www.townsvillebulletin.com.au/news/townsville/mothers-plea-how-do-i-get-my-daughter-off-social-media/news-story/2be4f64f0f54e2ce87c29c3d4ae5de46#_=_, December 19, 2017.